Visit Pairola during your stay in Liguria, Italy. The small place is idyllically situated on a gentle mountain slope. From the village one has a wonderful view of the entire coast. For active holiday makers the obvious thing to do is cycling and making hiking tours into the mountainous hinterland. Go and see the unique nature around Pairola. Whoever wants to go to the sea, can reach the coast and the beach within a few minutes by car. Also the shopping facilities can easily be reached by car. If you are looking for a quiet, idyllically located resort, then Pairola is exactly the right place for you. Pairola is part of the San Bartolomeo al Mare municipality. The village lies barely 2 Kilometre from San Bartolomeo al Mare on a mountain slope. 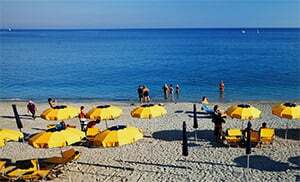 It was already inhabited in the Middle Ages and in the 12th century it was integrated into the municipality of San Bartolomeo al Mare. Pairola belongs to the San Bartolomeo al Mare municipality and is a village in Imperia province which lies in the Liguria region. Near Pairola are several other villages like: Chiappa (5.1 km), Richieri (2 km) and Molini del Fico (1.5km). From Genoa take the San Bartolomeo al Mare highway exit. Follow the Via Pairola SP34 towards Via Costa in Pairola.